“The Martian”, An Outer Space Story of Inner Space Hope. Matt Damon as Mark Watney comes to grips with a bleak landscape, literal and figurative, in Ridley Scott’s “The Martian”. Know two things about The Martian: 1. I normally don’t like outer space movies and, 2. 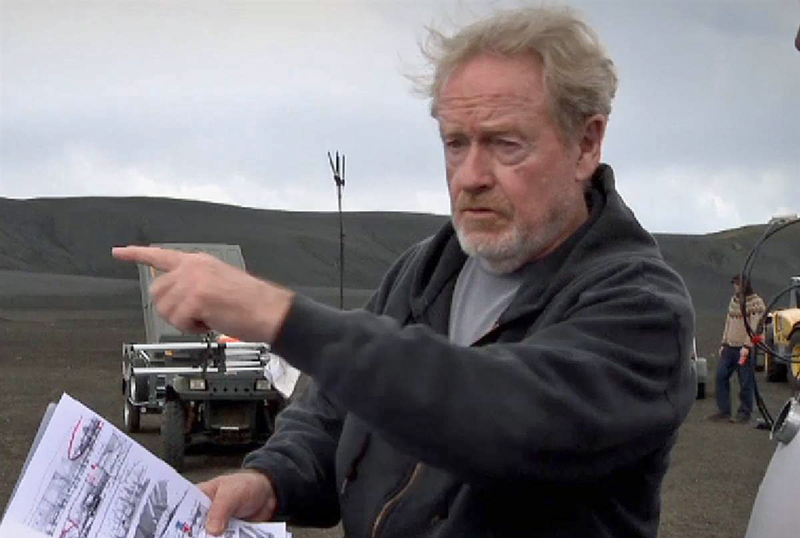 Director Ridley Scott is the single greatest film director of our time. 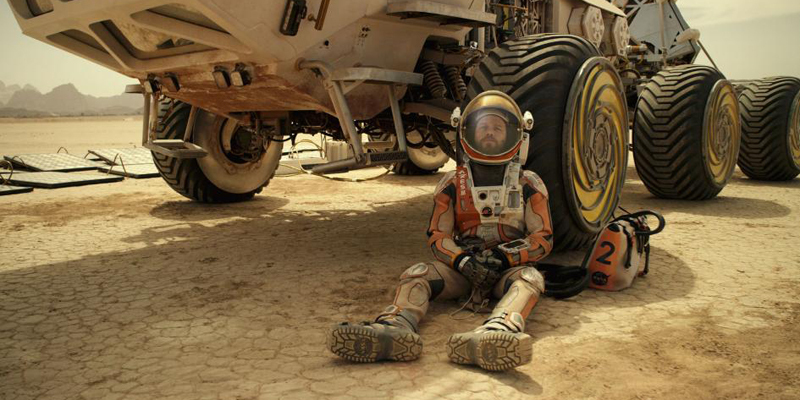 The Martian is a triumph of film we haven’t seen in over a decade- or more. It lingers like the one book you read as a youth that changed the trajectory of your life. As with the space mission it depicts, it uses existing technology masterfully to meld plot, theatre and visual effect into one of the finest movies in the history of film. It is without flaw. The Martian chronicles stranded astronaut Mark Watney’s survival ordeal after being trapped on Mars alone. It documents themes of survival, valor, and unity. But there is one shining idol in The Martian, one hero, one savior- and it is the savior we increasingly must look to in our modern world: Knowledge. The film is supported by an equally outstanding sidekick: Unity. 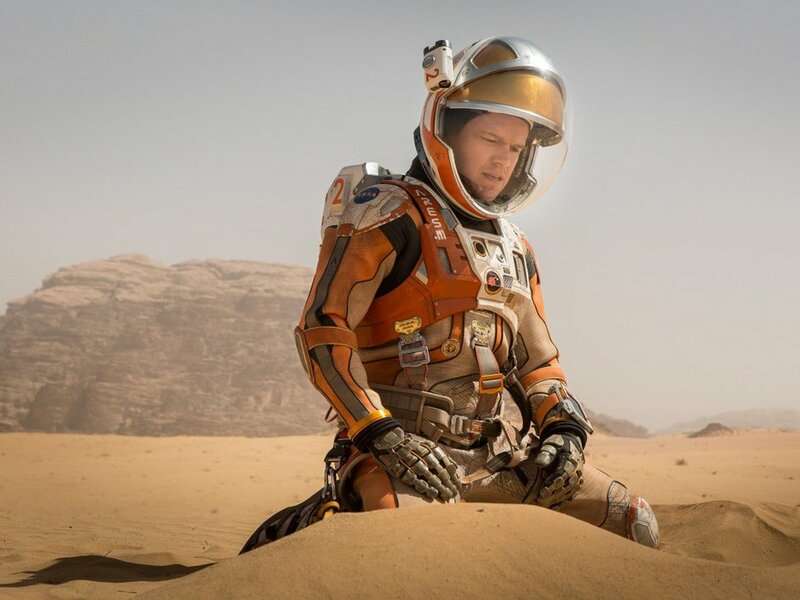 While the cast of The Martian is incredible, it is the theme that wins this remarkable journey. That we must think, learn and reason to survive; that we must do these things in unity and cooperation. The Martian isn’t about space exploration; it is about our collective future and mutual society on earth. The story is told against the dusty, hostile canvas of the Martian landscape, a metaphor for our terrestrial world that has become increasingly bleak- nearly identical to the dry surface of a hostile planet. While told as a story about survival on Mars, this is a story about our lives on earth, increasingly separated- and oddly united- by technology against a backdrop of survival in a modern age. In the end the film’s hero character relies on knowledge, learning, thinking and the international cooperation of a unified mankind for survival. It isn’t about reaching for the stars, it’s about getting back to earth. I don’t like “FX” movies, and that (by necessity) defines the space film genre’. But Scott creates visual magic in The Martian with effects that are stunning and vast. He creates a sense of distance and time in the open space visuals, and a sense of remote desolation in the Mars scenes.The film is also visually luxurious and adventurous. I grew up in the Apollo age, and this is the first thing that has ever made me want to actually go into outer space. Many of the Mars scenes in Martian were filmed in Wadi Rum Jordan, a desolate canyon system in the western Sahara that is home to extreme endurance events like the 150-mile Marathon des Sables ultra-running race and the Paris-Dakar rally. Wadi Rum was also the haven of the real-life Sir Lawrence of Arabia. This accounts for much of its authentic visual feel. The visual treat extends from judicious and masterful effects to stunning and desolate real life sets and finishes with remarkable treatment of the technology props from space suits to communications equipment to Watney’s Martian rover vehicle. That this movie is a Ridley Scott product is no surprise. But there are two surprises; Ridley Scott keeps churning out perfectly timed masterworks. Recall his landmark Gladiator, a film so perfectly done, so utterly out of left field, and so universally received across cultures that it became one of a small handful of modern classics alongside Forest Gump, Titanic, and a select collection of other blockbusters. Gladiator was released in 2000. It became a metaphor for many as the world squared off in a global war beginning the next year. And it expressed the fatality of conflict, even set against heroism. Scott also produced the landmark war film Blackhawk Down. Scott was even executive producer of the joyous Life in a Day documentary celebration of mankind around the world. As for the cast of The Martian, they are secondary but integral, and stand in the foundational role of theme and plot like concrete thespian pillars. Each characters performs, no character overwhelms. Their performances are subtle mastery. And then there is Matt Damon. Damon trumps the best of movie and theater by presenting characters on his personal canvas that is dashing and endearing. You love the guy. He is real, accessible and grows to hero status before your eyes. No author could hope for a better interpreter of their main character than Matt Damon, whether it is Robert Ludlum’s character Jason Bourne or as Will Hunting in Good Will Hunting. Finally, I acknowledged a hefty paradigm shift with two other similarly themed movies when leaving the theater after The Martian. Both Castaway and Life of Pi discussed themes of isolation and survival. These stories guide us through an ordeal against which our values are recalibrated. We learn what is important. But The Martian makes Life of Pi feel oddly clinical and cryptic and makes Castaway feel desolate and sad in theme. The Martian renews our faith. The great gift you leave the theater with after The Martian is hope, and that is perhaps our most valuable gift right now.